As is always the case with the films of the UK Festival of Zombie Culture as the week after draws on my memory of the films I saw gets more and more patchy. 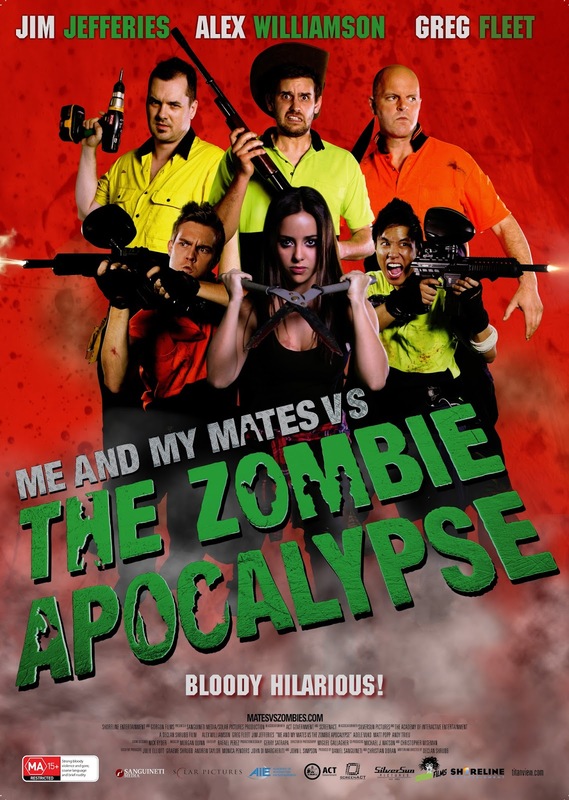 Today's film review is for Australian zombie comedy Me and My Mates vs. 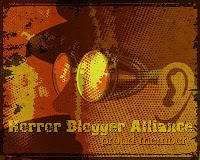 The Zombie Apocalypse that had it's UK premiere at the event. The movie was from the producer of last years Australian film Theatre of the Dead so I hoped it would be better than that one. The film is set not too long after zombie apocalypse has hit Australia and three friends; Joel (Jim Jefferies), Darryl (Alex Williamson) and Roy (Greg Fleet) have arranged to meet up at the telephone exchange they work at once they have all gathered weapons and supplies. They meet up as arranged, Roy bringing along his daughter Emma, but it turns out all they have combined are several crates of beer, a beloved multi purpose tool, and a shotgun named Betsy. The group decide to use the exchange centre to call the military for assistance but with rumours of the army brutally killing everyone infected or not is that really the wisest choice? Me and My Mates was a very funny film, certainly funnier than Cooties that was also shown, but this was also limited in places. Firstly I did not actually care for any of the characters, Joel is inoffensive enough but Darryl felt unrealistically stupid, more concerned with getting a place on Roy's local cricket team than the hordes of undead outside, Roy himself is kind of a stereotypical Australian as well as loud, sexist and homophobic. Later there are two younger men who join the group but I just found these two irritating and whenever they were given exclusive screen time I felt it was a waste of film. Thankfully 90% of the time the script is fantastic, the three main actors being comedians means their delivery of the lines was spot on, making even the most bland sentence into a laugh out loud moment. It was hard to dislike this film due to that very reason. The majority of this movie takes place in the telephone exchange station, it's a pretty dull looking location and also quite small so it very much becomes a character piece as well as saving on budget, it reminded me a bit of Stalled at times, though any comedy zombie film that features a toilet can't help but remind me of that one. There is quite a bit of visual humour on top of the decent script such as a montage sequence of a character attempting (and failing) to commit suicide with a shotgun, and a comic death involving fireworks. The zombies make up does the job, it looks pretty decent and there are plenty of them even if at times the film can't seem to decide which ones are inside and which are outside the building. There are classic zombie scenes here such as hordes eating the intestines out of a victim but there are not that many casualties. Some pretty cool zombie death scenes feature, maybe my favourite being one getting it's head cut off by a pair of shears, while two of the group being armed with paintball guns leads to plenty of head and ball shots (that the zombies still react to) but not too many zombie deaths. The undead here exhibit signs of intelligence, one figures out how to use a key card to open the exchanges main door, later a group use the severed bottom half of a ghoul as a makeshift battering ram, yet at other times they seem pretty dopey, unable to work out how to get through a narrow crawl space for instance. There manages to be a few sub plots running together, Darryl who is trying to find the right moment to tell Roy he has not only killed his wife earlier in the day (who had become zombified), but also that he slept with his daughter later the same day, Emma meanwhile is forced to decide whether to stay with her controlling father or attempt to leave with her wild boyfriend. These sub plots help to flesh out the characters and are needed as the main plot is merely surviving the onslaught however the dumb group can. It all leads up to a suitably epic finale in which the remaining characters take on overwhelming odds in slow motion, let down only by a machete that is visibly made of rubber and wobbling all over the place whenever it was swung. It is down to the actors and their delivery that I thought this was not a bad little comedy, with the wrong choice this could have been terrible but the script really gets a chance to shine and all delivered with such flair.